In November 2015, the DEA (Drug Enforcement Administration) announced Pittsburgh as the first pilot city in the nation where the 360 Strategy would be implemented. The goals of the 360 Strategy are aimed at stopping the deadly cycle of prescription opioid and heroin abuse by eliminating the drug trafficking organizations that fuel violence on the streets and addiction in communities. The strategy also includes partnering with healthcare professionals and engaging and strengthening community and social service organizations that are best positioned to provide long-term help and support for building drug-free communities. 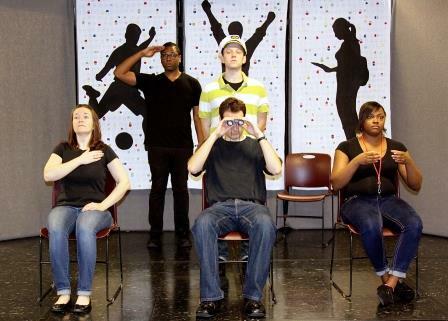 The DEA sponsored several performances of Off ‘Script for high schools in Allegheny County. In August 2016, Saltworks traveled to Washington DC to present the play to representatives of eight other cities where the DEA has plans to implement the 360 Strategy. They plan to license the play and utilize it in those cities as much as possible. We are excited to work with the DEA and, more importantly, engage more students to make healthy choices. To listen to a Saltworks Radio Interview, Click Here. To read a news article or view a news program about Off ‘Script, click here. To read an article in the Pittsburgh Tribune Review about Saltworks’ performance of Off ‘Script at Mt. Pleasant Junior/Senior High School, click here. To read an article in the Pittsburgh Post Gazette about Saltworks’ performance of Off ‘Script at Mt. Pleasant Junior/Senior High School, click here. To see WTAE coverage of Saltworks’ performance of Off ‘Script at Mt. Pleasant Junior/Senior High School, click here. To read an article in the Pittsburgh Tribune Review about Saltworks’ performance of Off ‘Script at Valley Junior/Senior High School in New Kensington, click here.